I imagine a guardian angel/fairy. The idea grew out of this baby. I guess it is suppose to work the other way around- creativity versus biology. She has a sort of roaring twenties hat or crown thing going on. I love the felt roses. I will post a little tutorial on them later- lots of fun and very easy. I made her thinking that she would hang on the wall. I got a little frustrated with the wings. It took several tries. Some times the hardest thing to do is keep it simple. I am having another attack of studio reorg. I have some great fabric for more tattooed guys- which ought to be happening soon- but I got it in January, I put it aside for later dyeing and now I can’t find it- ARG! Why does looking for fabric turn into clearing off bookcases and going through old magazines! 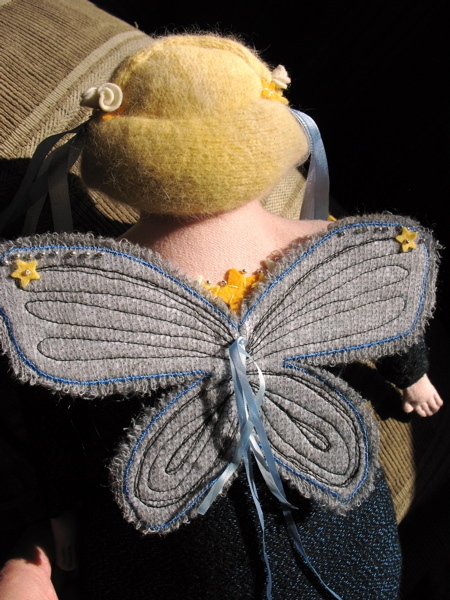 This entry was posted in doll, finished projects, General by mimik. Bookmark the permalink. She is just perfect. Good luck with the fabric hunt. She is my favorite of all the dolls you’ve posted. She has the look of true wisdom. For a minute there I thought the handsome fellows had a girlfriend…then the wings :) She is wonderful. She is lovely. I love her wings and look forward to the tutorial on the roses. They are lovely. Wow! 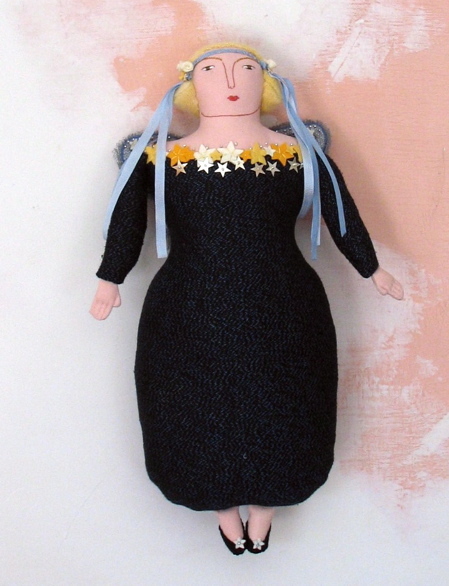 She looks great…I love the dark dress with the stars (in felt?) and the tiny shoes. 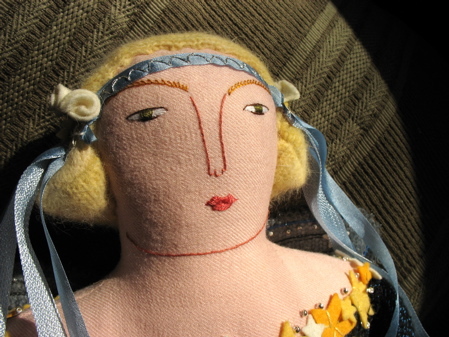 The embroidery on her face is terrific! Great eyes. another beauty mimi. you did some crazy cool thing with her hair. i’m trying to figure it out from the wing photo. the wings by the way look great. Ooh, I really like this one. She would make a lovely “Queen of the Night” in a production of the “The Magic Flute” circa 1920. The stars on the dress and her hair are particularly lovely!